I was going to put this into the Just Recipes section as that seems to be stalled a little, but on second thought most to the recipes in that section center around cooking on the BBQ grill, smoking, or in the home kitchen. What I'd like to discuss here are the meals that we prepare on the trail or in camp, while we all use quicky prepared foods like Ramen Noddles, Mountain House dried meals, MRE's and the like, I'd like to hear about the more inventive ways in which some of us cook healthy good tasting meals over a camp fire with backpacking cookware, hobo pots or small mess kits. To get it started, one of my favorites is beef stew, since I usually cook for just myself (usually the friends that I camp with bring their own, we might mix and match or share some stuff, but generally cook for ourselves) taking along some fresh veggies and a frozen piece of beef or small bag of stew meat isn't much of a problem, add a couple of cups of water and some granulated boullion, a little salt and pepper in a small pot or canteen cup and your on your way to a good meal. Another favorite is campfire beans, I use my mom's recipe for baked beans for the cooking liquid, molasses, yellow mustard, brown sugar, salt & pepper, and put it in a medium canning jar, in camp I soak the beans overnight, the next morning I rinse them, then cook up some bacon and use the drippings as a base for the beans, I put the beans in a small pot with the bacon drippings, add the flavoring liquid, top off with water to cover the beans, I bring it to a boil then move it just far enough from direct heat to get a slow simmer when covered. I let them slow simmer for four or five hours checking the water level once in a while, when the beans are tender I take the cover off the pot, as the liquid reduces the beans thicken up a bit, the finished beans are almost as good as oven baked overnight. We try all sorts of things, but prefer to grill food "skewer"/ "kabob" style. Many times we will cut up some venison/beef at home & bring it along with an onion & a green pepper or two. Or sometimes just bring a package of frozen venison/meat we have, & cut it as it thaws. Potatoes are a common addition too. We have also par-boiled some chicken at home & then freeze it & bring that to "finish" on the fire. Of course we also try to camp near fishing spots, ( which n Minn. is rather easy) so fresh fish for any meal is common. Fried in a pan, wrapped in green leaves/watercress or foil, or 'Planked/stick grilled ( can't remember the name of the method right now as it escapes me,but your put sticks thru the fish, binding it to a main "handle" stick.) Sometimes we dig a hole into a river bank, build a fire to coals, then put a light layer of dirt on coals & then wet watercress/grn leaves on the covered coals Then the cleaned fish, many times stuffed with wild leeks or even wintergreen or edibles like that, then more wet stuff, then cover with dirt & wait & fish some more. Then uncover later on & eat the cooked fish.. Good stuff. I have a lot more like the ones I wrote about, but I better wait & let some others post too. If.. ya want more ideas of things "I/we" do for eating out in the sticks. I will say that we eat pretty good when we are out. & a lot of this stuff we do, is light & easy to carry in, rather than hauling a lot of cookware & gear. We try to use what is available "out there" that Nature provides ( & practice skills),more than depend on lots of stuff, unless we are truck/car camping, then worrying about toting things on our body, isn't any worry. Got some recipes/ideas for that type of camping too. As I said.. I don't want to spoil this for others. Great post, just what I was hoping for, thank you. venison tenderloin (or venison steaks) and a baked potato. The venison I like to sear on a log that's been burning for awhile and the potato you can wrap in foil and just put on the edge of the fire for 1-2 hours or so. I've rolled more stuff in tin foil and tossed it in the coals than I can remember. A pretty common item is fruit (apple, pear or peach) cored and stuffed with raisins brown sugar and cinnamon. Great treat. I bought a small mess kit from Walmart. I'd love to see some pictures or ideas on what to use with that tiny set. I have this feeling foods are going to stick quite badly. Theory is dead, green are trees of experience. Not peeled potatoes baked in hot ash. I'm used to pull them out before they are cooked, make a hole in each and fill it with raw egg. Then I put them for a moment back into hot ash. Seasoned just with salt and pepper. It's tasty and filling meal. Remains of mass, hollowed out from potatoes can be used into stew or soup. It depends on which mess kit you bought, the hard annodized set they sell for about $25.00 is pretty good from what I've heard, the thin aluminum "boy scout" type kits from Coleman and a few other brands that sell for anywhere between $5.00 and $10.00 dollars are sure to burn food and be hell to clean. Personally I'd suggest using Stainless Steel, preferably the same or better quality as the USGI mess kit, usually one can find good quality small used cookware at thrift shops that nest, are easy to pack, and priced cheap. Also if you can find a 5~6 inch cast iron skillet they are great for personal trail cooking, combined with a small covered pot they make a fine minimalist kit. Last tip, cook over low to moderate heat, never on high heat unless you're just boiling water. aack... I bought the 'cheap' one. I've been shopping and shopping ...trying to find a good set. I definately want a frypan that goes with it. It seems its either all pots.. or just a fry pan for an average priced set. I've seen that oval set (mess kit) , that one makes sense to me. Ok guys. pop in some pictures.. we wanna see some grub cookin! 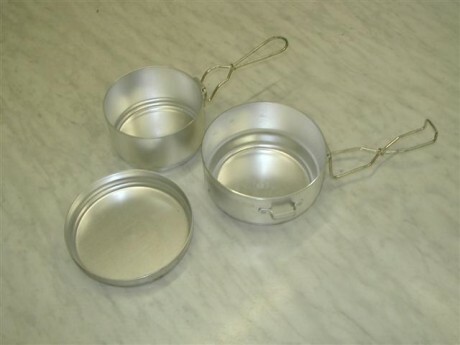 Woods Woman, don't be disappointed, I have aluminium mess kit for long years and for cooking (can't say for frying too) it's good. I don't say "best," but it works well. I prefer Stainless over Aluminum because Stainless is nonreactive, but there's a difference in quality when comparing cookware, your set for example looks like it's made of thicker material than the cheapy Walmart Chinese Boy Scout type kit, and most likely cooks very well, trying to fry eggs, bacon, sear a steak, or pan fry fish in something in the thickness range of a beer can ain't going to get it done. I prefer Stainless over Aluminum because Stainless is nonreactive, but there's a difference in quality when comparing cookware, your set for example looks like it's made of thicker material than the cheap Walmart Chinese Boy Scout type kit, and most likely cooks very well, trying to fry eggs, bacon, sear a steak, or pan fry fish in something in the thickness range of a beer can ain't going to get it done. Thanx for explanation, Moe M. I had never thinking about like this. And maybe there are differences between stainless kits too, because mine experiences were horrible. Food burned quicker than in aluminium kit. Aluminium is heated uniformly, not like stainless. But ordinary I don't sear steaks or fry fish on trails so you'll be right anyway. Cooking using natural materials is less likely to burn any food, Unless ya aren't payin' attention, & when ya are done there is nothing to clean... Ya just burn yur stuff ya used to cook that Ma Nature provided, & make more "cookware/utensils, later, if ya need it.. The merits of different cookware & how it is used , I thought was a different topic.. Forgive me if I am wrong. So I make them over the fire the night before , If... not in bear country. I use what they call a "Pie-iron"... I'll try to find a pic, or go take one of ours later. One of ours is square, & the other is round. They work good with pie fllings & even have beeen used for omelets & Beef stew... They are great to have if you are not packing them. Otherwise, ya have to use another, non - cookware/utensil method like "ash cake" or "bannock" style. Anyone know what I am talking about... & have some other recipes? Ours are "un-lined" & yes you are describing exactly what I was talkin about. Yes the square ones work fine.. Actually, less waste if ya buy the square bread loaves. That link is about the same things. I am gonna try & take some pics.. Kids are fond of them. I luv em when we use em. I have a pie iron!! I have this recipe of two cake mixes mixed and you just use a 1/3 cup with 3 Tbs. water to nuke in a bowl for a quick cake. I've played with that idea to make brownies in the pie iron... mmm.. nummy. Apple pie is still the fave here tho. Actually we are both right, if you were to take a peek into the kitchen area of your favorite eatery you'd find thick aluminum and stainless steel cookware being used by those masters that prepare your favorite dishes, you would also find very few of them that have burned food in them. The why is that they are quality cookware, the aluminum is thick and conducts heat evenly, the same for stainless, it has to be a minimum if 18/10 stainless to conduct heat for the proper preperation of food without burning it. That said, eveything depends on the heat used under the pan or pot, too much heat will burn food and have it sticking to the best of cookware, I have a couple of friends who have GI mess kits just like mine, they are always caked with burned bits on the bottoms, and the guys are always complaining that they're junk only fit for burning good food, I don't have that problem with mine, I think they are the best designed and highest quality cook kits you can find. The difference between mine and there's is that it's mine, I don't cook over flames, I don't cook right on top of coals, I don't cook over heat that's high enough to burn the oils that i'm cooking in. be it butter, bacon grease, or olive oil, once you burn the oils the food is next to burn and stick to the cookware, it's that simple. I've cooked steak over a campfire using aluminum foil for a pan and it turned out great, but given a choice I'd much rather have a cast iron grill skillet, but much of the time I use my GI mess kit because it's a good compromise, and it works. Control the heat and the food will cook itself quite well. I cook with a frying pan or skillet at least as often as I do on the grill top or in a pot, that's one of the reasons I'm drawn to the GI mess kit, throw in the canteen cup and cover and the cup stove and it's a perfect set, for my needs anyway. I've seen other sets that are nice and of high quality, I like the little nesting set that Walmart carries, it a series of nesting pots with covers that are made of hard annodised aluminum, but I'd be lost with a set like that, who can survive with only cups and pots, and no skillet, surely not me. Really great topic Moe M.! Thanks, I think it's interesting, but I'm biased . It's also interesting to me what we as individuals get out of our outdoor experiences, for some folks the views are the high, for others it's the solitude, some of us just love to sit by a fire a carve kurska's, spoons, and wood spirits. I enjoy the overall experience as much as anyone else, but a big part of my camping pleasures come from a well designed fire and some good grub (not to be confused with Mad Max's wood grubs). Like you, I enjoy roasting on a stick, baking on a flat stone, or broiling a nicely seasoned fish on a cedar plank, but I also get a kick out of using small skillets and pots converted to campfire cooking to see how well they work. I been pleasantly surprised at just how well these mostly discarded pieces have performed over the expensive high tech wonder ware that is being marketed to backpackers and campers today. Skillet.. I don't have any. Me and my friends have on trails a "Silesia pan," replica of cookware that was used by ancient Slave nation which used to live in Central Europe. It can be used instead plate on top of the primitive oven or as a frying pan. Handle is usually carved on campsite. We have never burn food on it yet... basting every meal is worth needed. Bread cake baking (or bannock)is possible too. Forest Turtle... OH I want one of those!! I've been wanting what they call here a discus, wich is very simular but heavier than the one you show by the looks of it. Umm...is that anchovies in with the eggs? And kidneys being fried up? WW: Silesian pan is great piece of kit, if cooking for all trip company is needed. I can understand... we'll all give & take due to what we enjoy! Over time... I reckon I will also. But at this time, I just enjoy using many of the thing Ma Nature provides, with a lil modification from "us". IMHO...I am "All for" using older "techniques/technologies"before moving on to the newer ones. 2 reasons... One is to be able to do things, without the new ones, first...("Walk" before "Run" thinking) & 2, is to be able to pass on the old things before they are forgotten because of the new stuff. I think ya know where I am goin with how I think..
We agree Moe M., on much of what we aresein here in this topic.. I hope it continues.. Much good info gettng passed here! That looks like a great "skillet"/ Piece of kit to carry. I am not sure ya would be familiar with what example I use here, but it reminds me of a "miners' pan", like they use to pan for gold in streams. There ya go... more than one use. Thanx for showing me/us your "skillet"/Silesian pan, It is good thing to remember. It's interesting how different people in different parts of the world adapt tools and other impliments needed in their every day lives that are so similar, yet have likely never seen those of others. The pan in those pic's from Forrest Turtle is common to central Europe as she states, yet it is very similar to the Paloli pans found in many Spanish and South American homes, and it also resembles the shallow Woks found in much of Asian cooking. I reminds me a lot of a pan that drew my attention a while back when the game show 'Survival' first aired, the contestants were given a fixed blade survival knife, a pan similar to that of Forrest Turtle's, and a bag of rice to be used as rations to get them started in their new invironment. I thought at the time that it was pretty functional, because of it's design it could be used to stir fry, boil rice, make soups and stews, and it also could be used to make breads, turned over it could be used as a make shift oven. I found that a pan of that design can be found in many Asian and Hispanic ethnic grocery and convienience stores for pretty cheap money, most are nothing more than hand hamered forged sheet steel, and that once seasoned, cook almost as good as cast iron, but at 1/4 the weight of cast iron. I find them interesting too Moe.. the way this one Forest Turtle is more shallow than my WOK I can see it being more 'packable'. I'd like to find one like Ft's .. Or make one. Any idea on how to go about that? I have sheet metal here and could get more if I need it. If that doesn't look like enough fun, here's what I'd do. I'd toss that sheet metal in a hot campfire and get it super hot. While it's heating up, I'd find a large, smooth-ish rock to use as a sort of anvil or die. Then I'd take the hot sheet metal, lay in on the rock, and pound the crap out of it with a mini sledge. Move it over the rock in a circular sort of motion while you're pounding the crap out of it and forming it into a shallow wok-like shape. My infomercial-bought wok (ca. 1993) has small hammer marks all over it, so I'll assume that's not an unreasonable finish. After about an hour of heating and hammering, you'll probably be good to go. Use an angle grinder to grind the edge into a circular shape. Rectangle could work too I suppose. Then I'd have to think there's some sort of heat treatment or tempering or something to be done. That'll be the easy part though. Then just season it like a regular wok. This is all off the top of my head, with only a shade-tree tinkerer's knowledge of metalworking so take it with a grain of salt! It's something I might try sometime though. All I'd be out is a couple square feet of sheet metal and an afternoon in front of the fire with a hammer and a rock. Sounds like an afternoon well spent, actually. Off the top of my head WW I'd be thinking more about doing a search on the net to find a shallow Wok or Paolie pan, if I couldn't find one, my next step would be to get a steel Wok and cut it around the sides to the depth that I wanted then file or sand the cut edge smooth. Our ancestors were smart, so they made only versatile tools with many ways to use. At that time it was needed because Slavic tribes were nomadic until 6th century. Silesian pan is about 30 cm in diameter and we usually cook in it meal for six people or so. For one person is too large and too heavy (it's about 4 millimetres thick). Besides cooking and frying it's good for digging holes for campfire or cooling hole for food (we usually travel on foot, no car fridge is near :-D). Pan can float - there isn't anything better as floating Silesian pan full of cheese and vegetables while you are enjoying cool water in hot day. And I'm sure there are many other ways to use. FT, you say the Silesian is 30 cm across and made of 4mm thick metal. How deep is it? That is the only other dimension needed to duplicate it, either by manufacturing one or finding a pan that is either the same dimensions or could be modified. Thanks for sharing the pan and a little history with us! OK, I measured one I have just at home. 30 cm in diameter, 2 mm thick, 3,5 cm deep. I was wrong, not 4 mm but 2 mm thick. Thanks, FT, for taking measurements off yours to share with everyone . I have one of those oval-shaped GI mess kits. I catch and fillet a mess of brook trout from a wilderness lake. Use the oval-shaped frying pan from the mess kit to cook them over a camp fire in unsalted butter. Use Old Bay to season to taste. Never gets old. cook them over a camp fire in unsalted butter. Use Old Bay to season to taste. Never gets old. And that is why a wok has replaced most of my cast iron for camp use, unless car camping. The "wok" is pretty much a generic name. I found a restaurant supply house that had every conceivable wok size, from 30" to 8". I have a 12" and an 8" packed away in the gear. They can do everything a cast iron "spider" can do, and 4x more...including double as a wash basin! OP.. will you be heading back to that store again soon? I'm interested in a smaller wok if you can get price quotes for me. The store is many miles and years away. These products are readily available through Oriental cooking supply houses. I don't have any links to offer right now, though. Might I suggest a replacement for the wok? In a pinch, a SS dog dish works as a pan.... &/or a wash basin. I have a couple, use them for cooking sometimes & for Duke too. Family Dollar/Dollar tree, Pamida, & such should have them & they are usually around $2. pllus or minus. Just thought I would mention it. Hey now.. I like that idea! I'll go looking for dog food bowls and maybe even those stainless steel mixing bowls. Thanks for the idea! I've got plans to try doing some shishkabobs on the Sixfooter stove I have for supper tonight. Beef,onion,mushroom, and green peppers I think. The Kabob should lay across nicely in those V cuts. what a great thread! Great tips and recepies! maybe this needs a sticky so we can come back to it easily? Angerland, did you have any luck finding one? The closest I've come is the disk down in the woods... I'm still pondering on how to get those things off..... my hammer doesnt seem to do the trick. No luck yet WW. I will post it up as soon as I do! Umm...no... they didnt say they had junk ones. These were brand new oily lookin things. Back to Moes post. Anyone here use cereal for snacking ? Like a gorp but can be used in heated water for a hot meal if needed? Granola or Grape Nuts come to mind. Anything that can be heated in water, I don't like raw. Like granola cereal. I've made cereal packs of Cheerios, Capt Crunch (or similar), a few raisins and/or some Frosted Mini-Wheats. Okay dry, and add some milk (1/4 cu powdered milk to 1 cu water) and you have a passable breakfast. The reason I asked was because I came across a bunch of homemade granola recipes and thought these might be good things to make, break into chunks and have in a jar in the car for emergencies. I dont think they'd go horribly stale in the heat of the car if they are sealed in a jar. ? And if the emergency or 'darn I forgot to take something with to eat" was on a chilly day , just heating up some water and dumping these chunks in would have a hot meal for the gut. I never found any cereal I could eat wet with just plain water, or rather wanted to. Although Special K and Coke is delish! No...seriously! I tried that at the Oregon Caves snack shop when I was about 14, and have it every once in awhile just for nostalgia. It sorta "fizzes" when you chew it. Hahaha!